Ever had that panicked feeling when you realize you forgot to get your propane cylinder filled? And that even more panicked feeling when you also realized that there is not a propane filling station open to fill your cylinder? 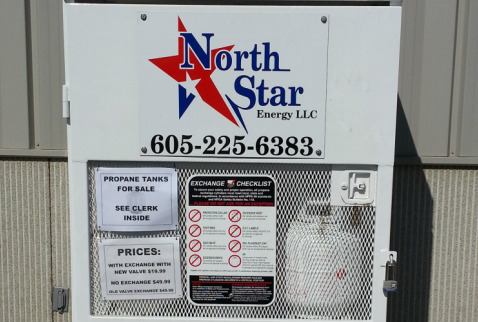 Why is it better to exchange your propane cylinder at an exchange cabinet serviced by North Star Energy? Most other cylinder exchange cabinets charge $18.00 or more for 15-17#’s of gas. That’s right...you are typically being given a 20 pound tank filled with only 15 pounds of propane. At any propane cylinder exchange cabinet serviced by North Star Energy, you can be assured that you are receiving a full cylinder that has been reconditioned by our trained staff. Don’t settle for less at some of the other propane cylinder exchange cabinets in the area. Always seek the cages serviced by North Star Energy.